One of the most enduring myths about Southern California is that there is no “change of seasons” here. It’s a widely held belief that our spring, summer, winter and fall are merely minor variations on a sunny theme. Yet our closets tell a different story. Cold-weather coats, jackets and rain gear huddle next to lightweight sweaters, hoodies and beach cover-ups. Bulky boots are sandwiched between strappy sandals and weathered tennis shoes. Winter-worthy wool trousers get squeezed in among summery cotton slacks and shorts. Tying all these disparate wearable elements together is our habit of layering, a savvy strategy for year-round comfort. The real challenge is how to keep our layers organized when sufficient or supplemental closet space is lacking. While attics and basements are commonplace storage solutions in many other parts of the country, those options are rarely found here — which may be just as well. After all, when unseasonable weather strikes, we like to have year-round easy access to our out-of-season apparel. Fortunately, there are several types of closet alternatives designed to fit various spaces and budgets. 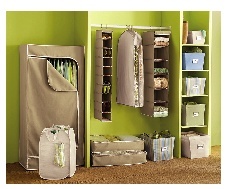 Here are some of the best options for storing a well-seasoned wardrobe. Hiding stuff under the bed has finally come out of the closet, so to speak. The ceaseless search for more storage has brought to light the potential of the often under-utilized underbed area. Long considered an awkward space best suited for burying bags of clutter during the ritual “company’s coming” cleanup frenzy, the bed’s basement is now perceived as an acceptable place for storing all types of foldable attire from sweaters to swimsuits, as well as shoes and other accessories. To organize this formerly chaotic frontier, there are plastic drawers, wheeled boxes, zippered containers and rolling shoe racks all sized to fit underneath most beds. Many of these storage saviors are designed with slide-out or roll-out features to provide ease of access. The Container Store (www.container-store.com) offers the widest selection of underbed products. For bed frames that aren’t quite high enough to accommodate underbed containers, there is a simple and inexpensive solution: bed risers, also called bed elevators, which give beds a 6-inch lift. They come in sets of four and are available at Linens ’n Things (www.lnt.com; $15) and other retailers. Another option requires more of an investment: the “dresser bed” or “storage bed,” a type of platform bed with built-in drawers (and no spaces for dust bunnies to breed). Several companies offer versions of this product in a range of styles and prices, including Taylor Gifts (www.taylorgifts.com), UltimateBed (www.ultimatebed.com) and Woodtown Furniture (www.dresserbed.com). The underbed solution is, alas, not suitable for suits. To take up the slack, so to speak, there are garment racks (available in both open and covered versions) and wardrobe cabinets (including armoires)for storing suits and other types of hanger-demanding apparel. Covered garment racks can be ideal for seasonal clothing storage if you have a bit of space in the garage or other out-of-the-way area (preferably somewhere that isn’t prone to dampness). The zippered, protective coverings are usually made of canvas, opaque vinyl or clear plastic. There are pros and cons to each of these materials. Clear coverings let you see what you’re storing but may not provide much protection against fabric-fading light. Plastic and vinyl keep out moisture but usually aren’t “breathable,” and vice versa for canvas. You can mull over all the different types at Bed Bath & Beyond (www.bedbathandbeyond.com; $20-$50). Open garment racks are useful for short-term storage and also come in handy for hanging up drip-dry laundry or guests’ gear. Some racks are collapsible so you can fold them away when not in use, but watch out for flimsy versions. Garment Racks Etc. has a good selection of well-constructed products for $60 and up (www.garmentracksetc.com). For easily accessible storage of frequently used, long hanging garments (namely dresses and skirts), full-length wardrobe cabinets are hard to beat. They also can be hard to find, especially in a budget-friendly price range. HomeVisions (www.homevisions.com) offers three affordable examples that include drawers and shelves ($157-$250). A more streamlined unit that provides only hanging space (a clothes rod) with an upper shelf is offered through Bedroom Furniture Direct (bedroom-furniture-direct.com; $186). Armoires — the shorter version of wardrobe cabinets — can be found at most furniture stores as well as via specialty retailers such as ArmoireGallery.com.